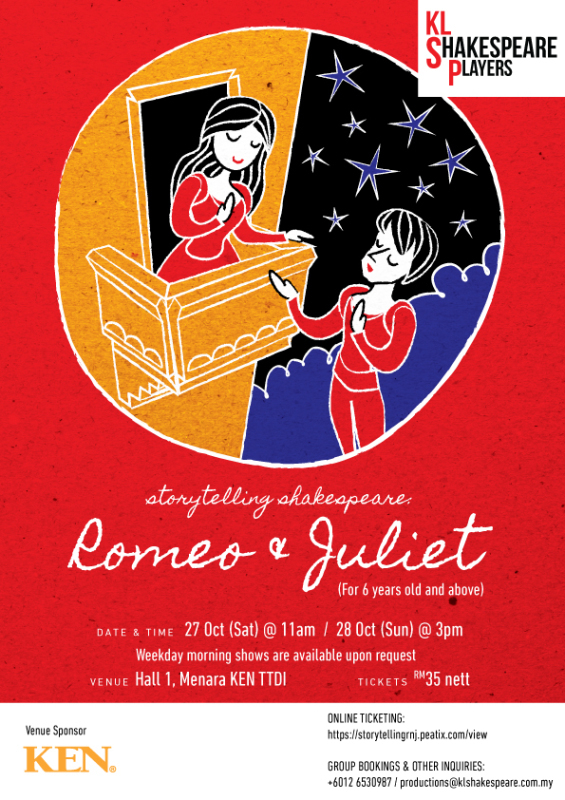 Building on last year’s sweet success of 'A Tale that Must be Told: Macbeth', the KL Shakespeare Players (KLSP) reaches higher this year with a storytelling of 'Romeo & Juliet'. This 60-minute interactive storytelling targets 7-to-12 year-olds, a demographic group not often catered to in programming live performances. KLSP performs, in verbatim some of Shakespeare’s language, “the fearful passage of [Romeo and Juliet’s] death marked love”. The show is developed to enable young audiences to sing, chant along and dance. Beyond the tragedy of these “star-crossed lovers,” this storytelling presents also the drama of the destructive enmity between two families—the Montague and the Capulet--and how their “ancient grudge” spills into the present to destroy the lives of the young. As this story ends with the death of the hero and heroine, KLSP has taken pains to unfold the situation with sensitivity and age-appropriate images. Children’s theatre specialist, Johnny Gillett, whose hand was in last year’s storytelling of Macbeth also participated in the creation of the storytelling Romeo & Juliet. Last year’s 'A Tale that Must be Told: Macbeth' staged with dolls has been performed nearly 40 times, traveling beyond the Klang Valley to Johor Bahru, Johor; Kota Kinabalu,Sabah; Kuching, Sarawak; and overseas to Manila, Philippines and Seoul, South Korea. Under the sponsorship and support of Yayasan Hasanah and the Ministry of Education, the storytelling successfully toured to several public primary schools.